The Ton December Release, Day 1! Direct from Effie: The Ton Couture Color is our curated collection of dye, hybrid and pigment inks. Our initial color release is made up of 25 dye inks, 4 hybrid inks and 2 pigment inks. Our first ink release is comprised of mainly jewel tones that can be layered over each other or stamped individually. In addition to bright jewel tones, we’ve included a crisp, true black dye ink, a copic friendly black hybrid ink and an all purpose smooth white pigment ink. We’re also very excited to announce the release of the first ever Rose Gold Pigment ink. I am so ridiculously excited about these inks. I haven’t received mine yet. They will all be shipping out Thursday. But there will be Rose Gold pigment ink. Rose Gold, people. Oh my word. And just look at all of those luscious colors…. let me tell you, they’re going to be perfect for our fabulous multi-step florals. Just you wait. On to the projects! This post is very long and photo-heavy, so bear with me. For my first project, I’m focusing on the new Rose Terrace background and the newest member of the bow family… Grand Bows! I thought the new bows looked like something you would find on a wedding gift, so I tried to make my card shower-appropriate. I stamped the Rose Terrace background in some mint ink onto a 4 3/4″ x 4 3/4″ square of white linen card stock. I then stamped the largest of the Grand Bows using the same mint and a light teal color. 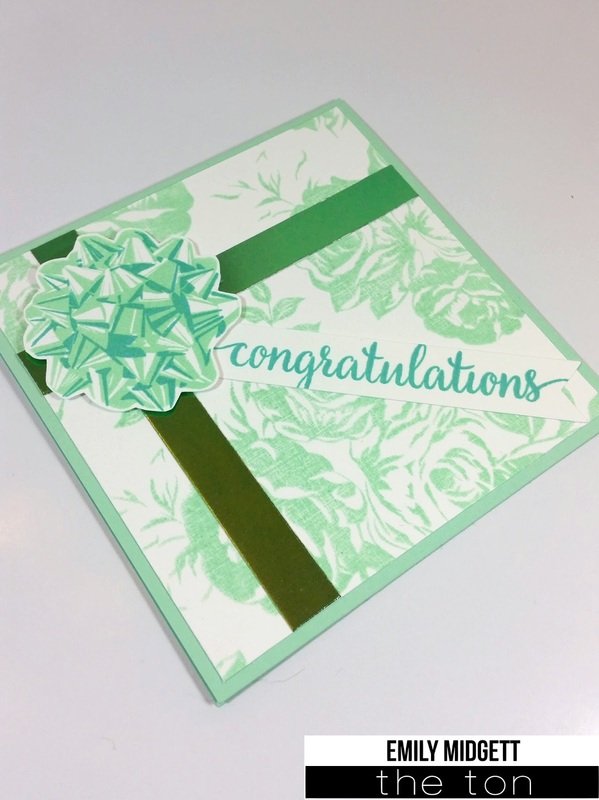 I fussy cut it out, added a “Congratulations” greeting from Large Peony 3 on a flagged strip of white card stock, then added some strips of mint foil card stock for some faux ribbon to complete my “gift.” I mounted the whole panel on a mint 5×5 notecard. My second card focuses on the stunning Rose Terrace background stamp. I stamped and heat embossed it onto a panel of hot press card stock using Bronze embossing powder. I then got out my trusty Zig Clean Color Markers and paintbrush to add color and shading to the panel. I filled my shaker with Clear Pink Coral seed beads, and Matte Gold, Peach Mousse, Sparkling Sage, and Glass Slipper sequins. Isn’t the background so pretty watercolored? Love it! The sentiment is the same “congratulations” sentiment from Large Peony 3 as used on my first card today. My next card is maybe my favorite today. There’s something about pink and mint that makes my heart go pitter patter… and these roses are just so beautiful. I started out by heat embossing the Rose Terrace image onto another piece of Strathmore Hot Press watercolor card stock using White Satin Pearl embossing powder. I added color and shading with my Zig Markers again, then added a sentiment heat embossed on vellum from It’s Cray Cray. I popped up the watercolored panel on a hot pink card base using fun foam. They’re a little hard to see in the photo, but I added a few sequins on either side of the sentiment- Glass Slipper, Fairy Pink, and Precious Pink. I can’t wait to send this one out, and I have the perfect person in mind. Now, to completely switch gears. My last card today is inspired by those Christmas decorations that you see all over Pinterest… the apothecary jars filled with beautiful bows. Since I didn’t have an apothecary jar die, I improvised and used an ornament die that was the approximate shape. I traced the die onto my white panel, then started stamping the Holiday Bows in light and dark gray in random spots, then stamped the new Grand Bows in red and darker red on a different piece of white card stock. I fussy cut the red bows, then placed and glued them onto the white panel. I wanted to make a holiday shaker out of the card, so I added a piece of acetate to the back of the negative die cut and filled the shaker with Call Me Maybe Red and Engine Red sequins, Round Silver and Silver Star confetti, and Diamond seed beads. I hope you’re as excited about these new releases as I am… Everything is so versatile and so, so classy. All of the new products will be available for purchase tomorrow, December 8 at 7 am EST, and will begin shipping Thursday, December 10. Now, for the extra fun part…. A GIVEAWAY! Effie has graciously given each design team member a $10 gift certificate to give away on each blog, while there is also a $25 gift certificate being given away on The Season! All you have to do to be eligible to win is make a comment here telling us your favorite set released today before 11:59 on December 11. The winners will be announced on December 13. Good luck!! Enjoy hopping around to all of the other Design Team members… I know I’m going to have inspiration overload looking at all of the fabulous projects! 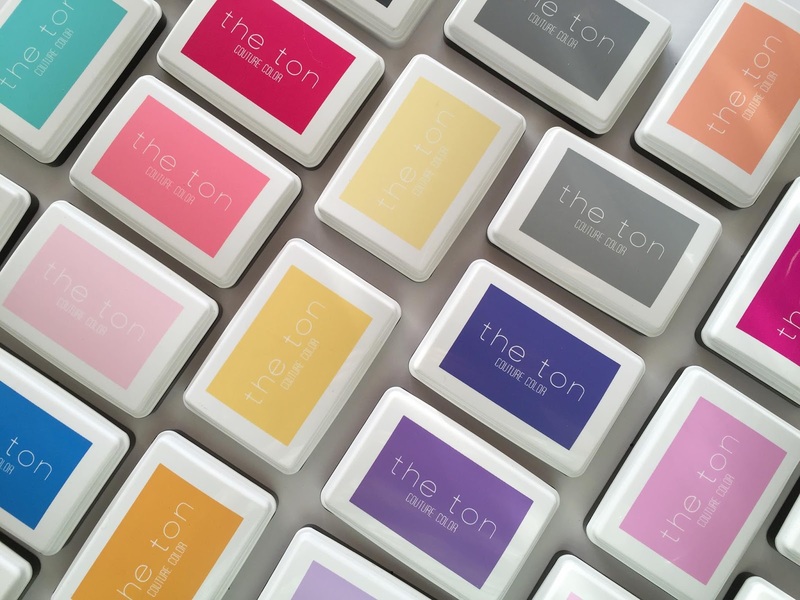 Don’t forget to leave a comment on each blog to maximize your chances to win a gift certificate to The Ton! Beautiful flowers and bows…oh my! Your shaker card is so fun and unique! I love how you used the bows inside an ornament shape! Beautiful cards Emily! my fav has got to be the bronzed card. How super beautiful !! Your creations are amazing. I love those pink colors. I can't wait to make the shaker card and play with new inks. I love your ornament card with all the bows inside!!! Absolutely beautiful!!! I love the use of the Bows stamp on the ornament. Lovely cards. Oh, those flowers and that shaker are GORGEOUS!! Emily, STUNNING! They're all gorgeous. I love the color combo of your two rose cards and the matching sequins, and the ornament is adorable. Thanks for sharing and inspiring. beautiful color choose for all your cards! The bows for sure are my favorite! Very pretty colors and designs. Oh you're so right, pink and mint just look so lovely together. Beautiful cards! Gorgeous cards! 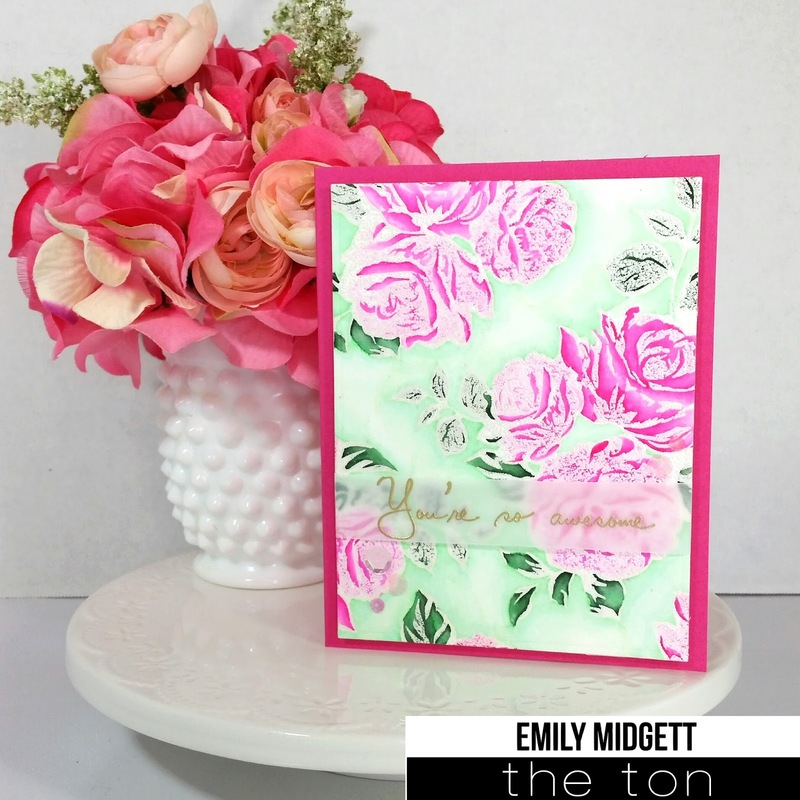 The water colored rose terrace background cards are both beautiful! And the last shaker card was made with lots of creativity! Love the shaker card! The colors are so beautiful. I have NEVER seen a stamp set from The Ton that I didn't like!! AMAZING work!! I am in AWE of you!!! Your cards are just beautiful, both the grand bows and the Rose Terrace background are equally my favorite and I a excited to try the new rose gold pigment Ink. Your cards are stunning! The background stamp is gorgeous! Wow, all these projects are beautiful! I think my faves are the second card: I love the Bronze embossing powder with the pop of color of the Zig markers and the ornament shaker card is so elegant AND fun! Gorgeous cards! I am so in love with the Grand Bows stamps! I think that set looks so versatile… a must-have! Love the amazing variety of cards. Gorgeous stamps. Oh wow! These cards are lovely!!!!! Beautiful work!!!! They are gorgeous and sweet cards!! Love love love those bows! 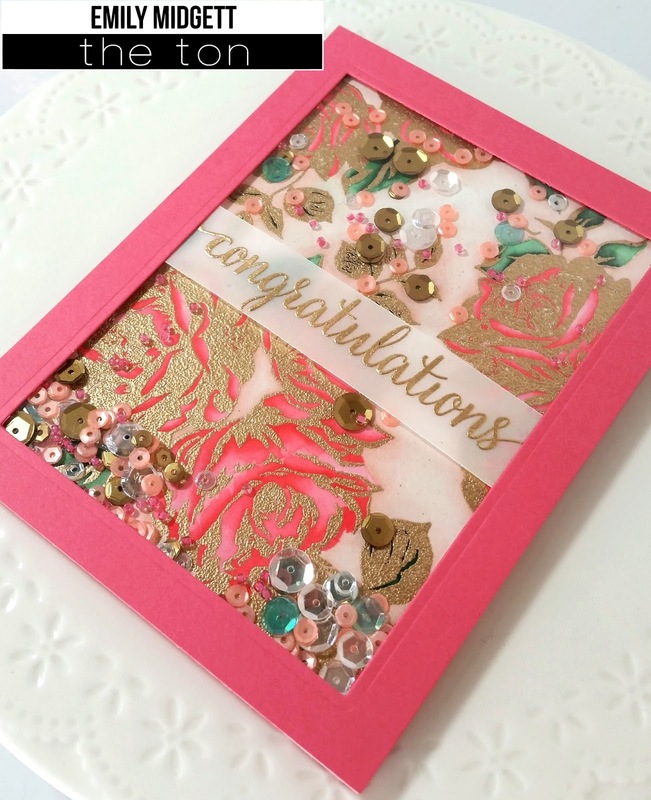 Beautiful cards with really gorgeous color combinations too! Wow! LOVE the BOW filled bauble! All your cards are HAPPY Emily!!! Awesome cards! Love the ones you made with the bows…very creative! Gorgeous ornament card, love the shaker and roses ones too. I love the ornament card with the Grand Bows stamp set. Beautiful! My favorite stamp set is rose terrace. Your cards are lovely. Beautiful cards!! Love the gold embossing on the roses!! 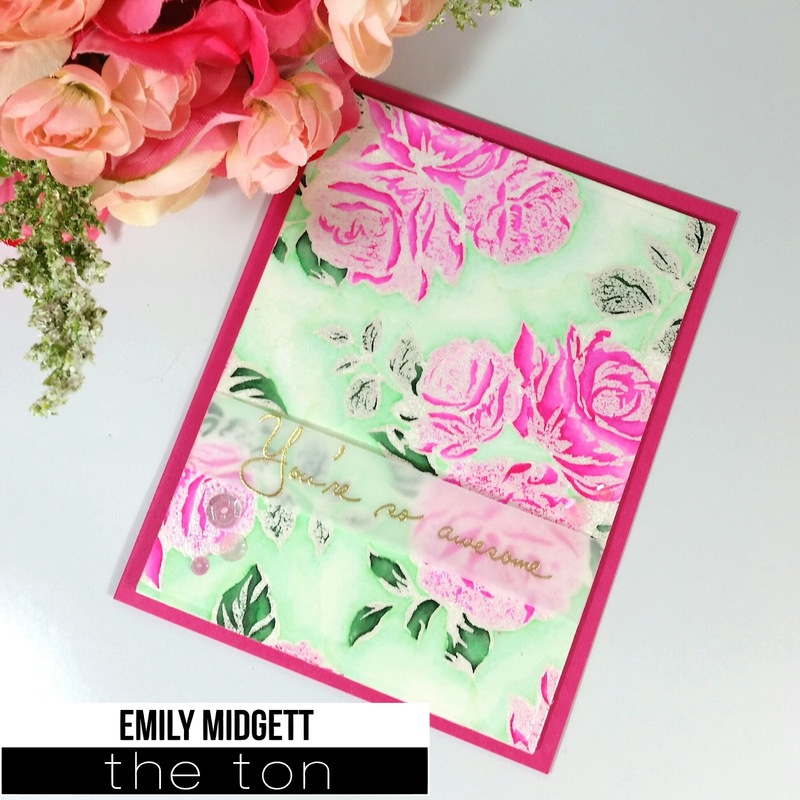 GORGEOUS cards Emily – they're ALL DELIGHTFUL designs and colours – LOVE THEM ALL!!! While the bows are STUNNING, Rose Terrace has won my heart!! !